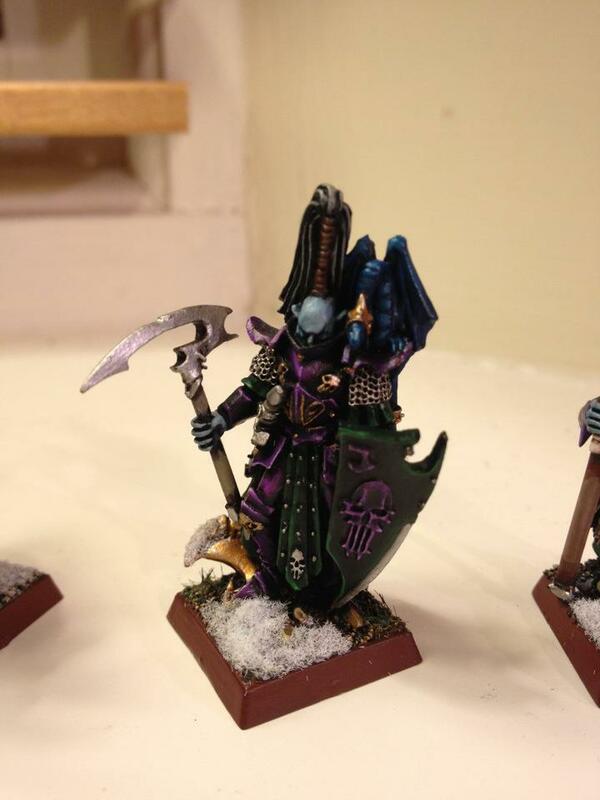 So here he is, the aforementioned Dread Lord and the first model painted for my Dark Elf force. The model was done some time before writing this blog but I wanted to keep the chronology of my force intact. I used this model as a test for my colour scheme and it turned out really nicely. It took me around 10 hours in total with some of that being staring at the model as I painted it working out colours and stages in my head. The model style has changed some what since its original paint job. The base was originally grass topped with a Dark Flesh base edge, now it is snow topped and also the base edge colour is graveyard earth. I decided that I didn’t like elves being pink skinned and so I opted for a colder and paler flesh tone making the elves look cold and evil. The theme for the force is a northern tower regiment and so the coldness and pale skin works well to support this. Next I decided to paint some standard foot soldiers to see how my army would look on a more regimented group of miniatures and also at a distance so I chose to do a group of dark elf spear men which I have around 60 of. Starting a new painting project or army is always a daunting task even to a veteran painter. I think many hobbyists make the mistake of building an entire 2,000 point army and laying it all out in front of them before they begin. This to me makes a mountain out of a mole hill situation where the sheer amount of unpainted plastic makes it hard to even begin! 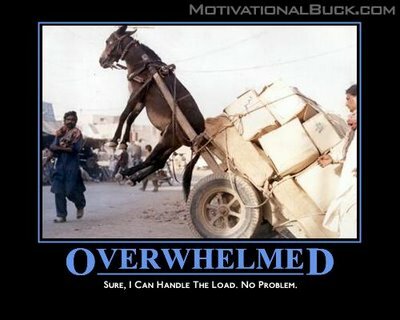 I didn’t want to fall prey to being overwhelmed by the task at hand so I took steps to manage this and give me motivation and encouragement. The first thing I did was base and spray all of my dark elf army. This meant that I had in some respects started the entire force and if need be I could play the odd practise game with no grey on the table. After this, I put away 90% of the army into cases, out of sight of my painting area so I didn’t have 200 models staring at me, judging me, demanding I paint them right away! This helped me focus on the few models I had out and allow me to concentrate on making them look great without worrying about the massive amount I had left to paint. Personally I am always encouraged by seeing finished models. Having some guys who are totally done and look awesome really gives me a boost and motivates me to plod on through the dull bit of base coats. To this end I decided the first thing I would paint would be a dark elf noble on foot, a single character model who I had not put into any of my lists. This was a good practise model for my proposed colour scheme and I didn’t have to worry about making mistakes because it was just one model. In the next post I will show you the results and talk about my thought process when painting him. Directly behind the table and out of shot of the camera is 2 mighty book shelves with all of mine and my housemates rulebooks and other assorted stuff. The table I use is a simple black one from Ikea. It is about 2’x6′ wide and cost roughly £20. It has sturdy metal legs with rubber gripped feet. As you can see I have plenty of room for my painting area, my paints to sit next to said painting area, my model boxes with bits and other stuff in, and a collection of cups and glasses! Lighting is a massive factor when model painting is involved and so I have a main room light hung in the centre of the room which is behind where I sit to paint. I also have a small bedside lamp on the window ledge to my left and finally a powerful desk lamp which sits just above my painting area. These lights help cast away a lot of the shadows around my work area and help me reduce eye strain as well as giving me ample illumination to see my models in great detail. The chair isn’t great, it’s just one of our cheap dining room chairs that I throw a pillow on the back for comfort! What do you think to my work area? Comments below, thanks! 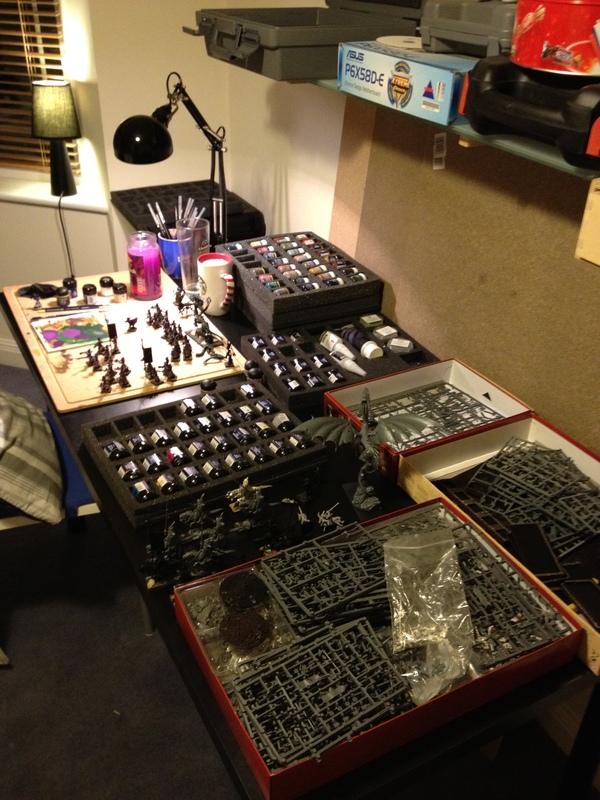 Welcome to my blog which will follow me on an epic journey as I paint my Dark Elf army ready for war! I decided to do this because it’s nice to look back and have a visual record of all you have done and the process. I will be posting articles on techniques I use, colours and opinions on basing and painting minis in general; and hopefully these will be both useful and interesting to read. 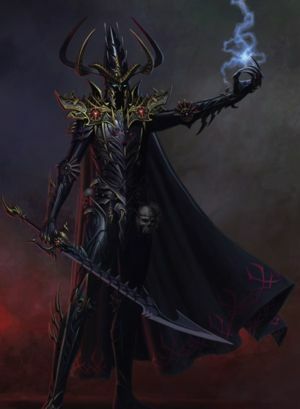 This is just the beginning for this site, I intend to publish all of my painting images on here be it dark elves or other models I happened to paint in between. Please feel free to leave comments and follow me using my twitter handle or the signup widget on the right.